"An overweight dinosaur but on the road it's actually a great machine. Just don't go chasing the latest GSX-Rs"
The Kawasaki GPZ1100 is more sporty tourer than sports tourer. Launched with zero cutting edge technology but a honking great engine with a hearty midrange that makes rapid riding easy. 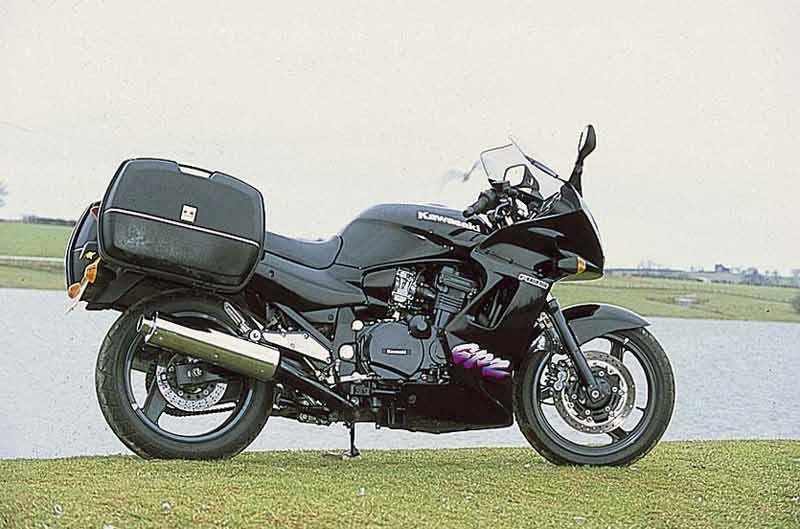 On the spec sheet the Kawasaki GPZ1100 is an overweight dinosaur but on the road it’s actually a great machine. Just don’t go chasing the latest GSX-Rs on a twisty road. 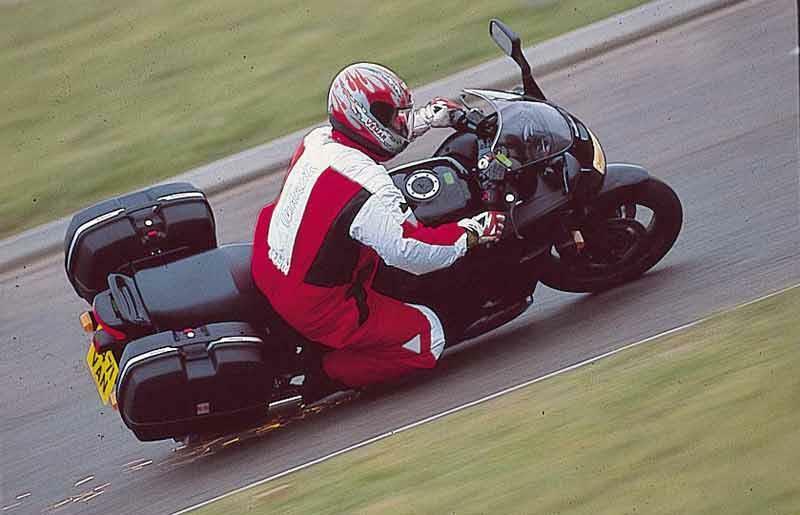 The Kawasaki GPZ1100 is heavy plus that weight’s carried quite high. 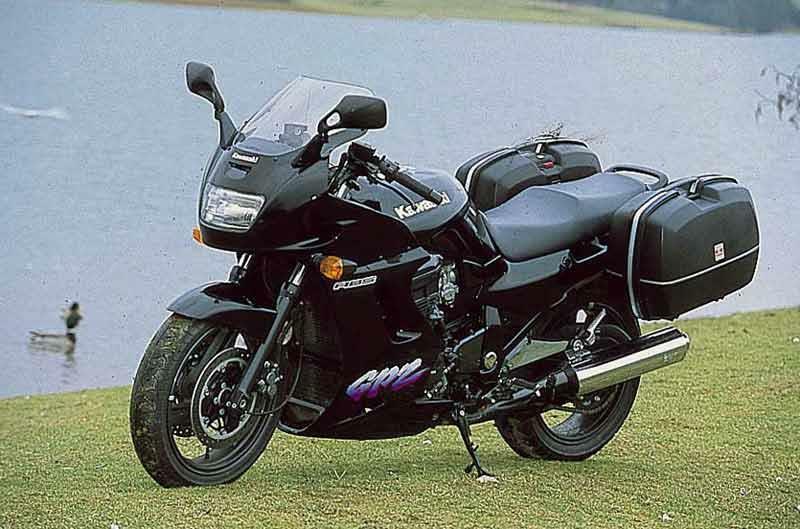 The GPZ1100 can feel a bit of a handful at walking pace but get moving and it carries itself with amazing poise. 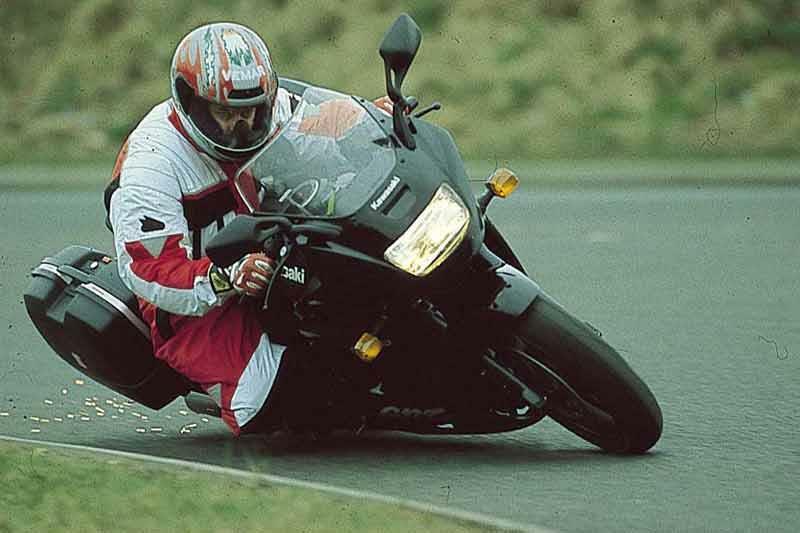 Great all day the only problem comes if you try and chase sports bikes on the Kawasaki GPZ1100 – the suspension and extra bulk means its hard work. Straight from the Kawasaki old-school GPZ900/1000/ZX10/ZZR1100 family – and none the worse for it. The Kawasaki GPZ1100 is gentle at low revs but comes out swinging like a healthy prize fighter by 4000rpm with more to come the higher up the tacho you go. The top end of the Kawasaki GPZ1100 can’t match the latest tackle but who cares? Carbs means smooth delivery, good economy and occasional icing. Reliability-wise it’s good news. 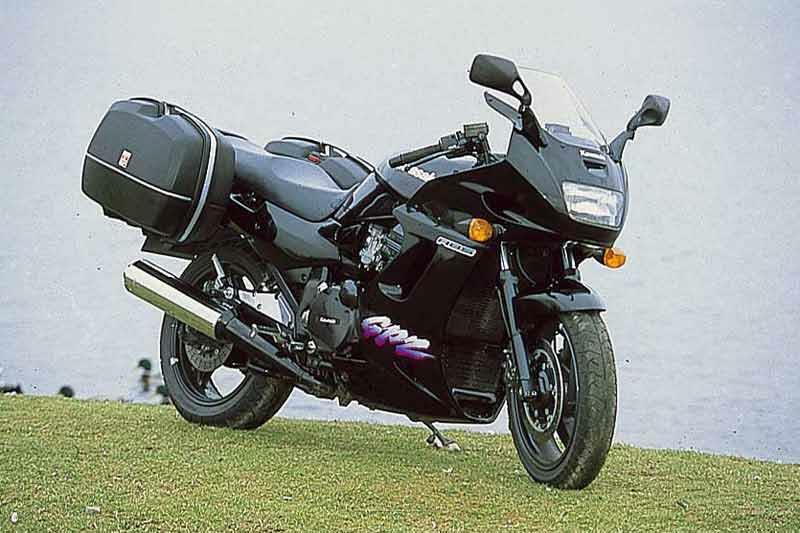 The Kawasaki GPZ1100s engine’s strong and easily capable of six figure mileages. There’s no major mechanical problems with the Kawasaki GPZ1100 but build quality was poor. 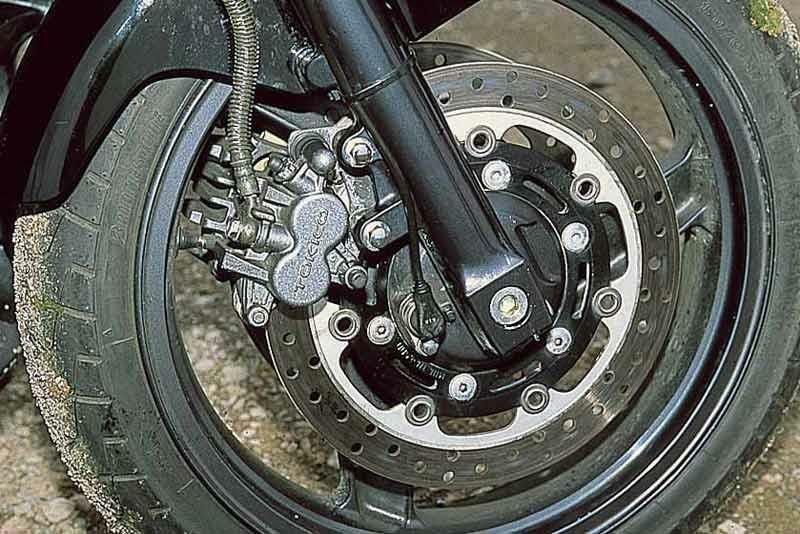 Brake callipers, wheels and the exhaust all corrode easily on the Kawasaki GPZ1100 and the motorcycle can look tatty fast. Never flavour of the month and quite rare on the used market – but Kawasaki GPZ1100s are often at bargain prices. 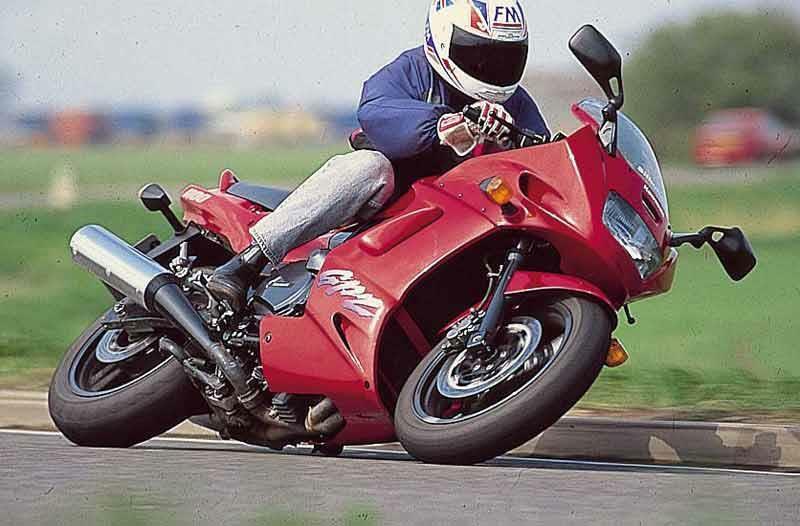 Owners are more likely to be older gents and unlikely to thrash or neglect their GPZ1100s. Watch out for high-mile commuters – the suspension and chassis bears will be tired. Yamaha’s XJ900S Diversion is cheaper to buy and run but slower. Find a Kawasaki GPZ1100 for sale. Insurance group: 14 of 17 – compare motorcycle insurance quotes now. The Kawasaki GPZ1100 screen, riding position and seat work well. That means long days in the saddle can be achieved without aches or a numb-bum on the GPZ1100. Pillions are pretty well catered for too. 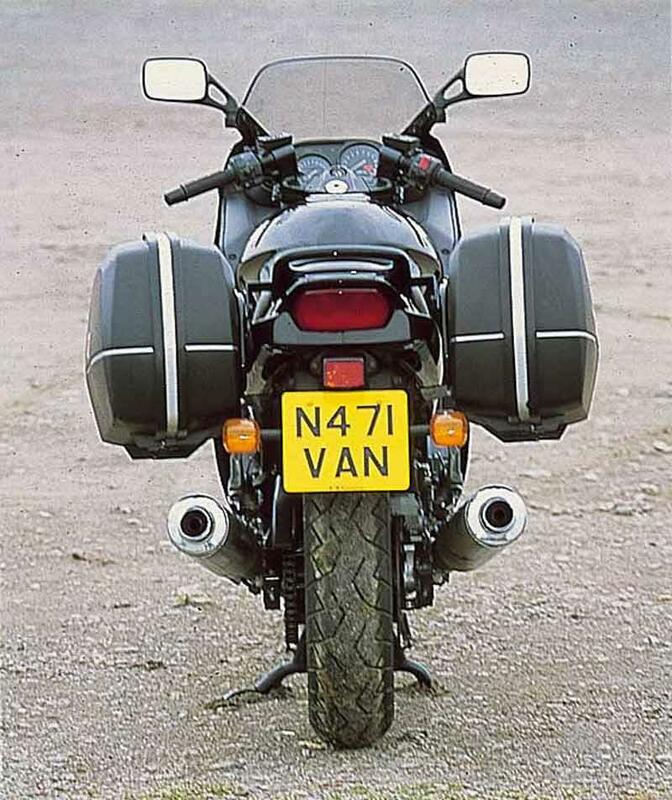 An ABS equipped version of the Kawasaki GPZ1100 was available but at just over a grand more than the standard bike few were sold and the plug was quickly pulled. 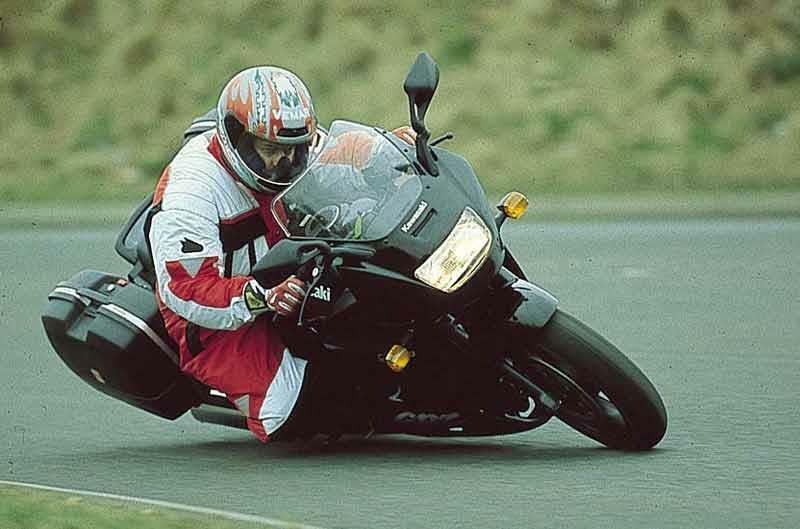 1995: Original Kawasaki GPZ1100 model launched. 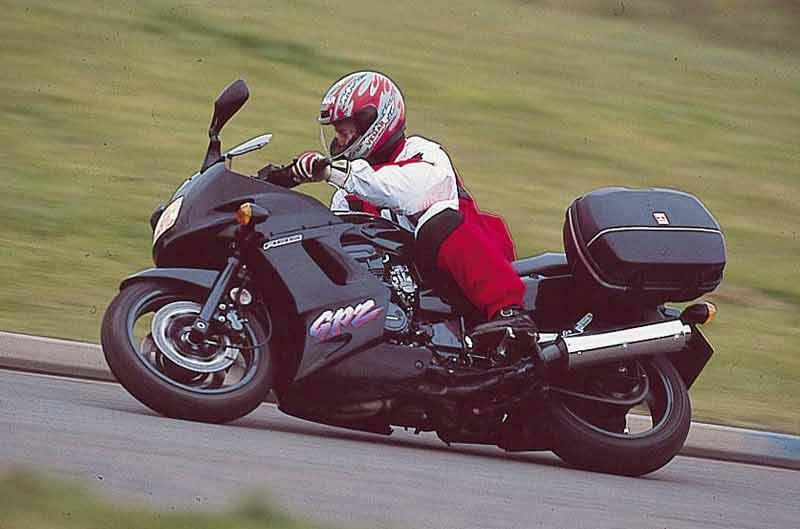 GPZ1100ABS: Offered during 1996 and 1997 but at £8995 few were sold. 10 owners have reviewed their KAWASAKI GPZ1100 (1995-1998) and rated it in a number of areas. Read what they have to say and what they like and dislike about the bike below. I'd go "5/5" because it's that good, but I don't want to appear biased. I'll go 4/5 because the front brakes aren't radial brakes on inverted forks (ha!). IF they were, it'd be a 'nothing better out there' response. The weight of the bike actually makes the thing a joy to commute on. Can you go 6/5? The motor is that good. As noted before, my engine sports an 1109 big bore kit that really wakes the motor up. My ZX1100 Ninja (ZZR1100 in Euro-speak) makes 129 bHp at the rear wheel with a header, jet kit, and ignition advancer ... the GPz is stronger, so I'm going to conservatively guess 130. Carbs are re-worked with a jet kit and pods running through the V&H exhaust. Personally, I think the exhaust is leaving a few ponies in the motor, but it's plenty strong. ZZR/ZRX based motor is a rock. Mine actually has an 1109 kit, carbs have been re-worked with K&N pods, running a V&H pipe. The pipe is the only thing I'd change, the pistons and carb work make this thing surprisingly fast. My bike is a former track-day mount for the group control rider. It's got straight rate fork springs and a Race Tech modified rear shock; do those two things to your GPz and your heavy-weight will handle like a middle weight ... it's THAT GOOD. Imagine this bike flying around a race track, it did, and it's got over 70,000 miles on the motor. What a champ. I do all my service, including mounting and balancing tires. I run through about 2 sets a year and I wait for the high-end sport tourers to go on sale and offer rebates. At less than $200 a set, and doing my own work, the only other expense I have is oil changes. If I wasn't so hard on tires I could spend quite a bit less. Braided brake lines, grippier brake pads, sticky tires, straight rate fork springs (for those tempting track days), and a re-worked rear shock makes the big GPz a different bike all together. I may try a Corbin seat, but the stocker is so good I haven't been able to pry the money out of my wallet for the seat. Fine. Purchased from a friend who bought it from a control rider at a track day school in Southern California. Heavy bike to ride around town but pulls away effortlessly leaving everyone behind. Get it on the open road and its superb, effortlessly climbing hills in top gear with limitless acceleration. Reliability is excellent sailing through the last few MOTs without a hitch. Parts are getting harder to come by but do come up for sale. Original new parts are mega expensive but if you're ok with pattern parts you can keep this bike running for years. High ride height even on lowest rear suspension setting. Top heavy but comfy in the seat. Twin disk with twin-pot calipers are pretty good at stopping this heavy lump. Engine is powerful and smooth. Pulls well across the rev range. Discover can be lumpy and the idle adjuster needs using when riding. Bullet-proof block. Regular oil change and a chain oiler are essential. Occasional lubrication of other moving parts helps keep things running well. Private sale. Test rode and was hooked. Was on a Honda Goldwing 1000 but this is a different beast altogether. I knew what I wanted when I picked the big GPZ up, so there is no "let down" as some would post. It's a sport-tourer, which is basically the same thing as a 70s-80s UJM; and THAT is what I am after. Big bike, big weight, big power, big dependability, and no surprises. Perfect bike. It's a Kawasaki; you can beat on it all day and it will just keep on keeping on. I didn't buy it for a 'glassy finish' but for all its other qualities. It needs nearly nothing. Adjust the valves in the spring and ride for a year. Repeat. I like to push the thing pretty hard, so sporty tyres get retired about every 3,000 miles; for most with this bike that is a lot, but I do the occasional track-day with it ... yeah, it's that good, just get a good rear shock and straight-rate front fork springs, and good tyres. The bike as standard is brilliant. Especially for the money. However, I've done some things to make it 'my bike': fork springs, rear shock, full exhaust, jet kit and individual filters, and full sport tires ... oh, and an 1109 piston kit (surprise for all the big sport bikes out there). It's a daily commuter with full-sport ability; not the best at either, but very good at both. Private owner. Got it cheap at $500 ... seriously, that's CHEAP!!! I had to put a bit in it, clean the carbs, new fork seals, battery, and tyres ... but it's one of the best deals that I've ever got. I bought mine with a couple of thousand miles from the original owner who did not like the standard seating/bars arrangement. Neither did I- the bars are way too far forward for all-purpose work. The stock saddle is downsloped and narrow. So on went Heli Bars and a Corbin, along with a full set of Givi hard bags. Now past 101,000 miles, the bike is the most reliable machine I've ever owned and still runs very close to perfectly. The engine is a dream to work with in all kinds of conditions. Smooth above 65mph. Outstanding mid-range, gets you out of anywhere in a hurry without having to search for thrust. Rides well, but tallish and rather top-heavy. Obviously, I've adjusted and being a long-time Kawasaki guy, I'm used to the tallness anyway. Never a hiccup and power everywhere. At 101k mi., still no repairs. How much better does it get? Still on the second chain and third battery. Third set of steering head bearings- the roads around here are pretty bad. Love the traditional, easy-to-use instrumentation. Heated grips a must in this region (north central US) and not hard to add. The horn was a joke so on went a Fiamm. Great touring bike for long travel on back-roads. Plenty of power but the bike can't handle with a real sports bike. Comfortable riding position, but a Corbin-type seat and handle-bar risers are necessary for more than 500 miles a day. I've been looking for a new bike for the last year (new Thruxton or RnineT??) but I still haven't ridden a bike I enjoy more for travel. Decent overall ride, despite minimal suspension adjustment and modest quality parts. Turn-in requires more effort than most bikes, but it is really stable in the corners. Steel brake lines help. The engine is the best part of the bike. Smooth with great power at any rpm. Owned the bike since new in 1996. 57K miles. I had a transmission bearing blow out at 37k miles. No other major failures. Valve shim check every 6000 miles. The engine. Handle bar risers for old men like me. I paid $8000 full retail in 1996 and I still am riding it regularly. Local small-town dealer isn't cheap but works with you. The kid at the dealer who put the GPZ together out of the box 20 years ago is now the service manager. The salesman coached my kid's soccer team. best big engined bike I've ridden so far. Awesome acceleration even with all that weight. Better on a straight road or motorway, just eats the miles but cumbersome around town and very twisty lanes. If you can find one at a good price it will just keep going even if it doesn't quite match the new boys today! 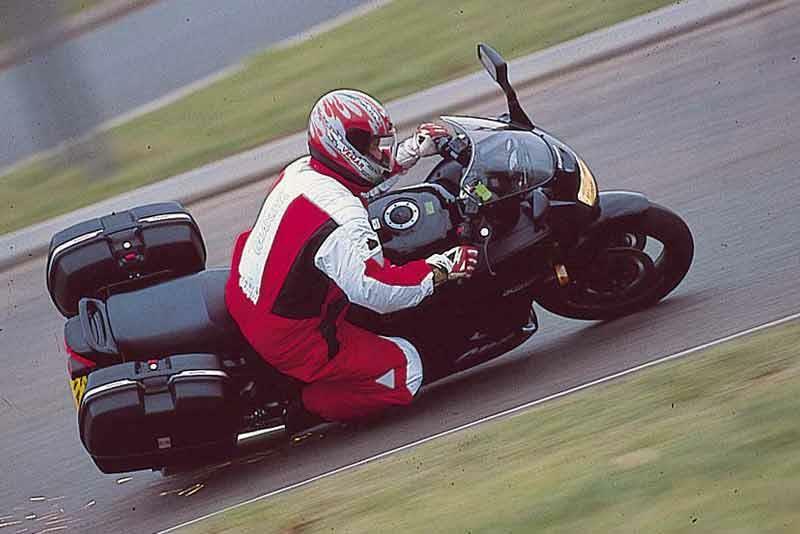 Been in the saddle for a couple of hours with no issues, and a pillion doesn't really make much difference to performance although because of the relatively low pillion position, they will often ride side saddle, peering around the rider. It's a high bike so anyone less than 6 ft will need to set the rear damper on the lowest setting and even then you can't quite get both feet on the ground. Brakes are superb, the twin disks and 2 pot callipers mean some serious braking when required. Definitely a straight road and gentle curve bike though! Reliability is superb, mine has never let me down - even with a battery a bit flat it still turned over and started. The aluminium parts are starting to corrode especially the brake callipers, but a quick wire brush and spray and they look OK again. With all that plastic, it still looks good with very little tatty stuff visible. It's easy to service the bike myself, all I have done are oil changes, strip and flush the hydraulic brake system, two new tyres fitted and clean the air filter. Bought the bike with a Givvy rack - wish I'd kept it and bought the bags - can't get one for love nor money now. Not a great bike for load carrying unless you take out shares with a bungee company! The two little hooks bellow the seat are quite handy. The space under the seat is limited so you might fit your fags in there! One problem with a bike that was only produced for 4 years is it's tricky getting parts for it. Plenty in the US though. Bought this bike privately with FSH and a great price - Kept hold of it as it's fun for any event and getting a bit rare now. Good bike. Does what is required of it. Plenty bottom end and midrange. Comfy, good for touring. A bit heavy. I've had the GPZ/ZX1100E for 3 years and have had heaps of fun on it. It is heavy but when you get rolling the power is quite effortless. It is reliable but the exhaust fell apart, corroding at the welds. A new Remus 4-1 sounds better and looks the biz. Apart from that I've only replaced anything that perishes apart from an oil seal on the gear selector. You can't twist through canyons like an R1 but open it up on a motorway and 'it'll go stink'... The Goodridge metal hoses have given me fabulous breaking, a must if you want to avoid break fade. The GPz1100 is a bit of a simple bike by today's standards, no real frills here. It is very comfortable for long rides and the engine is a real gem with lots of torque. It's very hard to find parts as not many of them were sold, so nobody really carries them. The engine is very similar to the ZRX1100 though, so that does help. 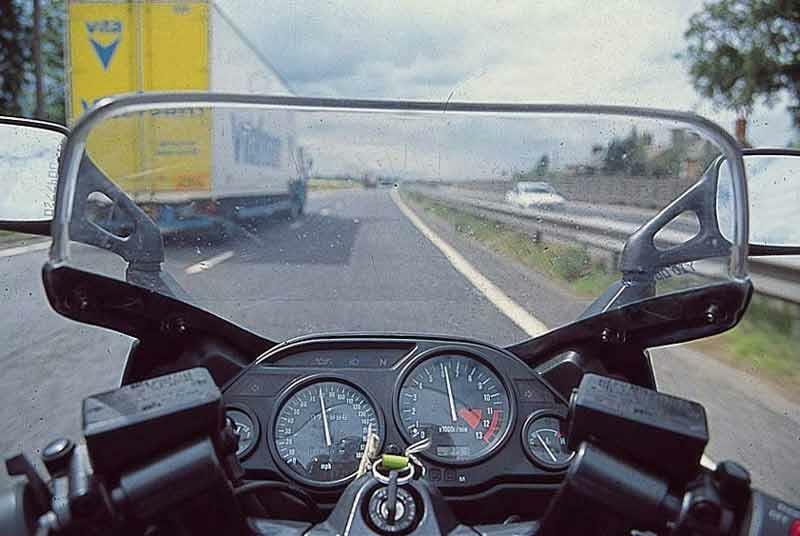 The bike can be a bit ponderous at low speeds and it also prone to head bearing wear, which makes matters worse. How fast does it go mister?